A Prunus domestica L. cultivar. ‘Fruit, medium sized; roundish oval. Skin, purple. Flesh, rich, juicy, and excellent, separating from the stone. A first-rate dessert plum; ripe in the middle of August. The tree is very hardy, and an abundant bearer. Shoots, downy. This is not the same as Perdrigon Hâtif and Moyeu de Bourgogne with which it is made synonymous in the Horticultural Society's Catalogue, both of these being yellow plums.’ [Hogg – Fruit Manual p.717/1884 as ‘Perdrigon Violet Hâtif’]. ‘There are two plums known under this name. Both are small, oval, purplish and are covered with a thick bloom. One, however, which seems to have been earliest known, is sweet, rich and of very good quality, ripening about the middle of August. The second variety was named by Calvel. It is vastly inferior in quality to the first and ripens in July. Neither variety is well known in America.’ [Plums of New York p.439]. Plums of New York lists synonyms of both plums under this heading. Hogg’s ‘Perdrigon Violet Hâtif’ is clearly the superior plum. Pomona Austriaca figures the plum ‘Die Violette Rebhahnpflaume’ or ‘Perdrigon Violette’ [Pomona Austriaca t.197/1792]. This may not be identical to ‘Perdrigon Violet Hâtif’ but is probably very similar and is the illustration used here. Listed in Addenda to the 1857 catalogue as ‘Early pedrigon’ [Plum no.12/1857]. In the absence of any notes from William Macarthur we cannot say which of the two Early Perdrigons he grew but it is likely to have been the later maturing, superior plum. 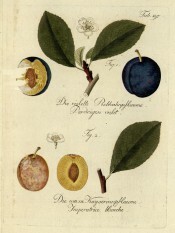 Prunus domestica ‘Perdrigon Violet’ | Pomona Austriaca t.197/1792 | Pomologische Bibliothek. Perdrigon Violet is the plum at the top.